Just in case you haven’t already heard, Team Orange will be coming to the Great Barrier Reef’s Port Douglas with a select group of Australian accountants and bookkeepers for a 3-day industry exclusive retreat from 3rd to 5th April 2019. As if a few days in paradise learning, networking, and exploring isn’t enough, it is an all-expenses paid trip! From your flights to a five-star room, entertainment and excursions, we have you covered. Ready to secure your spot at Receipt Bank Exchange? One of the easiest ways you can earn the required 100 points in Orange Select is by referring industry colleagues to become Receipt Bank partners. This is your guide to referring like a pro and getting your friends excited about Receipt Bank and Receipt Bank Exchange. Be genuine! Share what excited you about Receipt Bank and what benefits you’ve seen personally. Honesty is the best policy. Tell your industry colleagues how excited you are about the opportunity to earn your way to our partner retreat by referring friends. Then let them know that once they become a partner they too can earn their way there. Give them a brief overview of what Receipt Bank does, but don’t go too in depth unless they ask for details. Leave it to us to do the demo. Ask questions. Not everyone knows what they want, or what they need. If you can, find out what’s causing them trouble, and then suggest how Receipt Bank might help. If you’re having trouble thinking of who to refer, just tap into your network. Perhaps there are accountants and bookkeepers that you refer business to, or vice versa. Or maybe you exchanged contact info with someone at Xerocon or QuickBooks Connect last year. Invite them to coffee and take a photo of the coffee receipt with the Receipt Bank app, demonstrating how easy it is to use. Send them a link to the next Receipt Bank 101 Webinar. Let us know if you have a group of 10 or more friends/ industry colleagues in Sydney and we will host a wine and cheese night in our office, to introduce them to Receipt Bank and answer any of their queries. Regardless of whether you are attending a networking event, or chatting to a long-time industry colleague, here are a few key points to keep in mind. Ask if they’ve ever heard of Receipt Bank. If not, tell them about us! Tell them what your experience has been using the technology. How many hours do you save? What do you do with that time back? If rubbing shoulders with industry leaders and Receipt Bank executives, attending educational masterclasses, and networking with like minded professionals in a luxury setting has your attention, don’t wait to secure your spot at Receipt Bank Exchange as space is limited. I recently started using a new productivity tool, Receipt Bank, and already I’ve noticed *insert your success story (such as saving time, winning new business, improved client relationships)*. 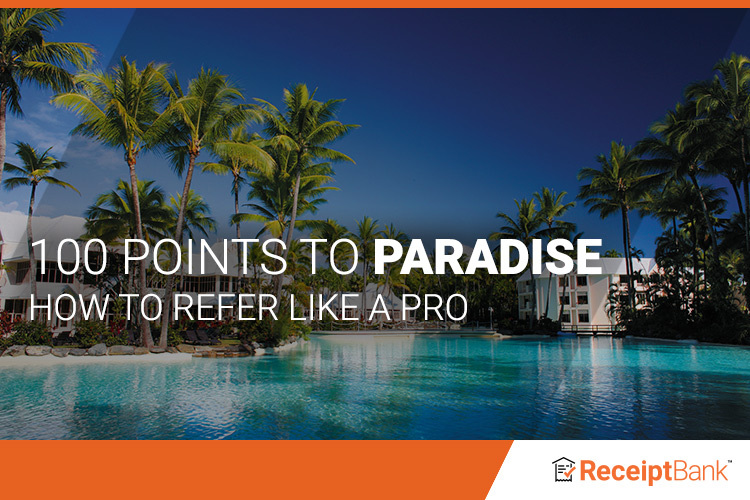 I’ve just heard that they are hosting an exclusive, retreat for their accounting and bookkeeping partners called Receipt Bank Exchange in Port Douglas this April (3-5). There will be keynote speakers, breakout sessions, and excursions for some fun in the sun. I am hoping to earn my way there by referring industry colleagues to check them out and you’d be able to do the same if you partner with Receipt Bank. It would be great to see you there! If you are interested in more info, please contact my Account Manager at Receipt Bank - *insert Account Manager’s name* by calling 1800 107 451 or emailing *insert Account Manager’s email address*. Beyond this exciting retreat though, I really think you’d find Receipt Bank useful in your practice. Would love to tell you more and answer any questions you have about it. Please don’t hesitate to reach out.